There are endless uses for a retail customer feedback survey. Not only can you determine if a customer is happy with their shopping experience, but you can also gain insights about the store layout, merchandising, marketing, and customer service. 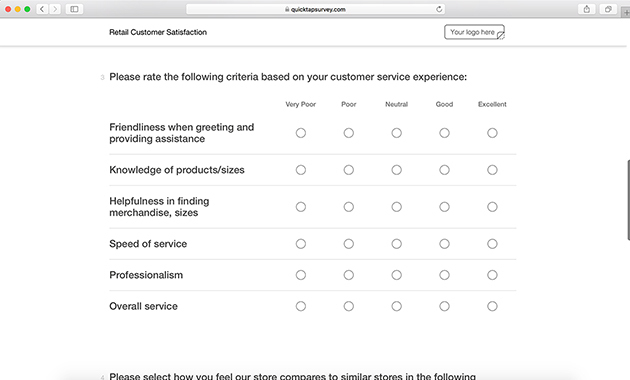 What is a Retail Customer Satisfaction Survey? 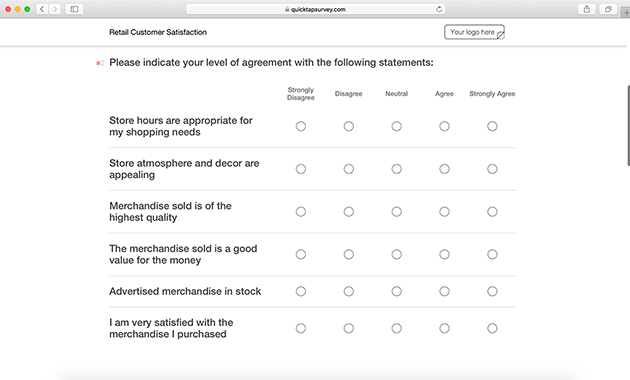 A retail customer satisfaction survey template is a survey that asks shoppers a variety of questions about their shopping experience. The purpose is to provide store owners with insights into a shopper’s experience. 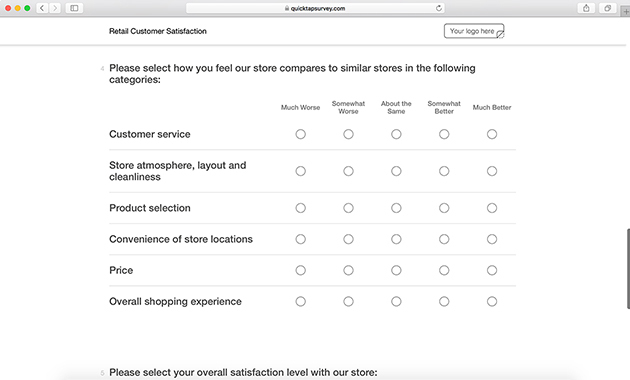 Satisfaction surveys provide a multitude of insights that go beyond a shopper’s satisfaction. These insights can include success of marketing efforts, store layout, and many others. Using QuickTapSurvey, a mobile offline data collection app, data can be collected directly in a retail store right after point of purchase. This guarantees that the shopping experience is still fresh in the customer’s mind and will greatly improve the accuracy of the data collected. It can also increase response rates compared to email or online surveys that the customer has to find themselves once they return home. Since data can be collected offline, QuickTapSurvey is perfect for in-store data collection since it can work without a network connection. Likewise, kiosk mode means the survey can be left in the store without an attendant restarting the survey. It will automatically refresh after each survey completion. 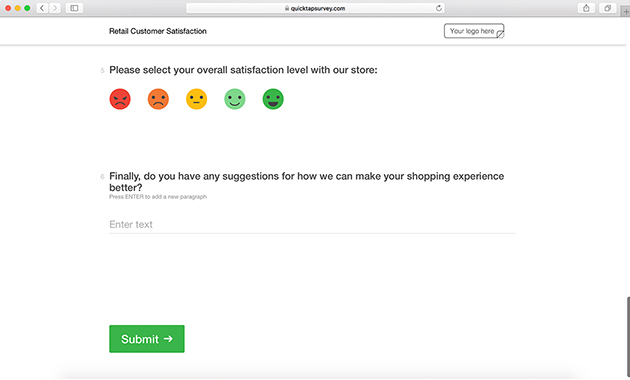 Who Should Use a Retail Customer Satisfaction Survey? Anyone who sells merchandise or a service and wants to provide the best experience and customer service to their customers should consider using this survey template. Why Use a Satisfaction Survey? 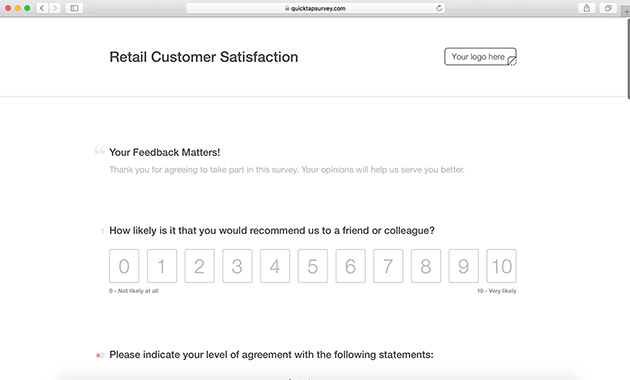 Using a retail customer satisfaction survey will allow you to make continuous improvements to your store. It can help track how successful marketing efforts were and improve customer service. If there is any doubt about what your customers are thinking or feeling, a customer satisfaction survey could prove to be extremely useful.